"'Bock's Car' took off at 3:45 in the morning in pitch black and returned to base at 3:00 in the afternoon. 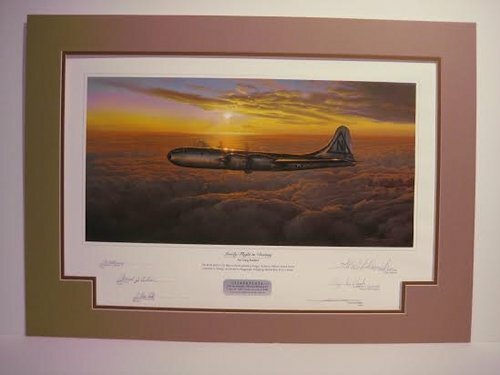 It was basically hazy mid-morning when they were over their target, so the only really good time to picture it, to artistically create a strong print, would be at sunrise. 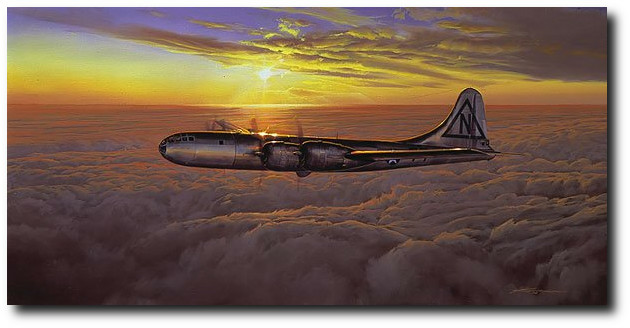 I had originally painted the plane already at altitude, the other way around, with the sun on it and a lot of clouds in the background, but it didn't have the weight I wanted. "Sunrise was also a good time to set the image because I could identify with the crew in a way; having myself flown all-nighters many times - missions that start in the evening and end up overseas as the sun is rising - I really had a feeling for the mental state the air crew was in at the time. I know it was a strenuous and tenuous time for them. That's why I wanted to show the airplane laboring under the weight of its payload and the crew laboring under the weight of its responsibility. That's why I called it 'Lonely Flight to Destiny.'"